Del Palmer plays Kate Bush songs live for the first time in decades at 40th anniversary concert! Some events just end up feeling quite historic, and this was one of them. Cloudbusting created a spectacular show in London on Saturday night. The entirety of The Kick Inside was performed in album sequence to mark the exact 40th anniversary date of the record’s release (February 17th 1978). 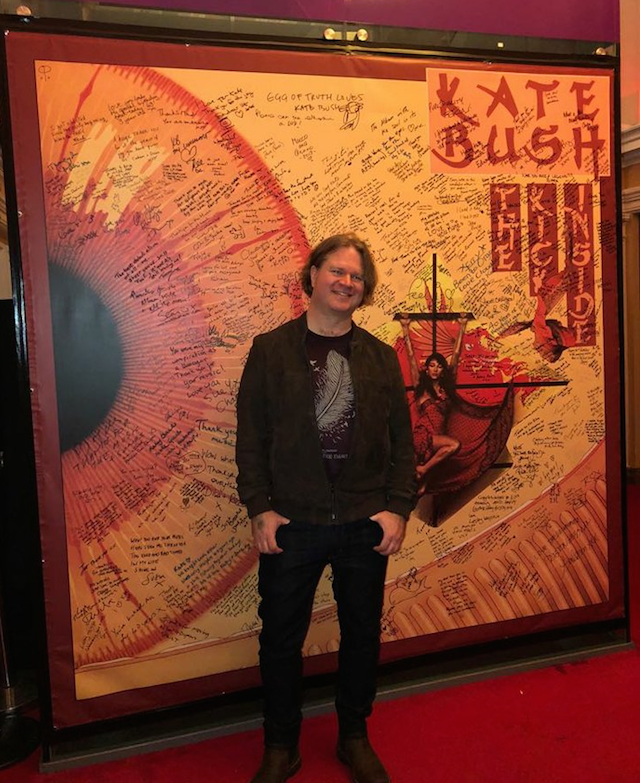 A sold-out crowd of 1,000 fans thronged into the Islington Assembly Hall and were wowed by a richly conceived, musically accomplished and tastefully staged show which cleverly but subtly echoed the structure of Kate’s Before the Dawn concerts. The first act featured superb versions of songs like Love and Anger, Breathing, Night of the Swallow and Running up that Hill. It built up to a thunderous King of the Mountain before the stage was cleared and a projected filmed interview of Del Palmer, with photos of Kate from her early career, ushered in “side one” of The Kick Inside. Throughout, singer Mandy Watson brought a searing authenticity to her vocals, never attempting to parody Kate’s voice. The result is a performance from her that is consistently sensational. Mandy always addresses the audience as herself, a singer, never pretending to be Kate, just a genuine fan of this music wanting to do it justice. She deserves special praise for taking on the sheer array of Kate’s most elaborate songs which the band had woven into this show, and making it seem effortless. Mandy was joined by backing vocalists Julia Krajewska (also on secondary keyboards), and Nadie Keating – their spot-on delivery enhanced and complemented each song terrifically well. Moving had background projections of Lindsay Kemp in performance while The Saxophone Song featured sublime saxophone accompaniment from Vicky Cowles. After a suitably dramatic Strange Phenomena, Kite featured surprise guest drummer Preston Heyman who of course had played on the Tour of Life, and on the albums Never For Ever and The Dreaming. The crowd warmly cheered Preston’s arrival on stage. The Man with the Child in his Eyes added the Brilliant Strings quartet to the stage and also a very moving dance performance by none other than Kate’s longtime dancer and choreographer Stewart Avon Arnold, performing with his dance partner, Tori Wood-Ives. Stewart took his bow to an audience clearly thrilled to see him dance to Kate Bush music once more. Wuthering Heights closed out “side one”, ending with a sea of waving arms throughout the crowd. There were even bigger surprises to come for “side two”. 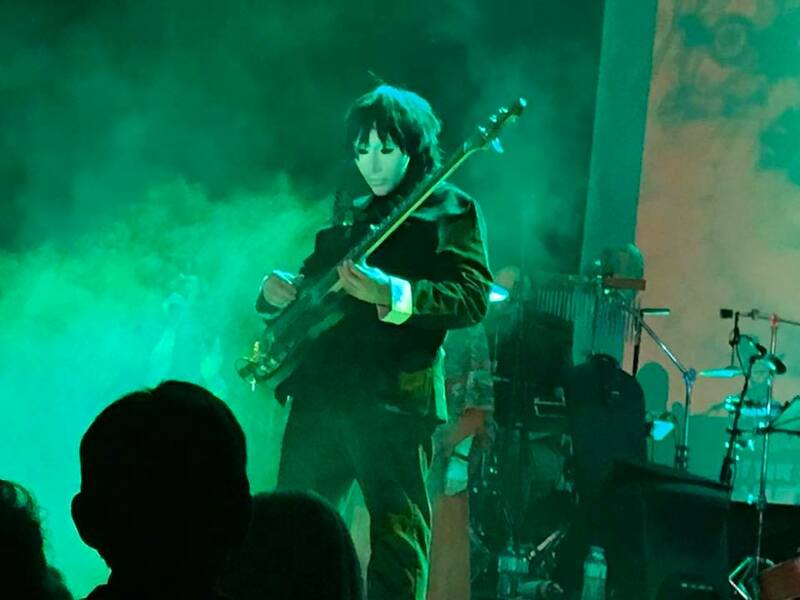 Sure enough, a mysterious black costumed figure in dark wig and white mask had arrived at the front of the stage and, after theatrically bowing and throwing an arc of glitter, proceeded to play bass guitar with the band on the song. Mandy then unmasked the stranger to reveal DEL PALMER himself! This sent the venue into ecstatic uproar – Del has famously not performed any incarnation of Kate’s music in a live setting for decades now, but he has made an exception after being wowed by the enthusiasm and hard work of the Cloudbusting team. Del also played on Them Heavy People, joined once again by Preston Heyman – a Tour of Life reunion! Legendary drummer Stuart Elliott was in the audience and received a huge round of applause when Del pointed out the only person in the room who had actually played on The Kick Inside! With Room for the Life and the string-accompanied take on The Kick Inside, the band completed their superb tribute to Kate’s first record. And incredibly, the music just continued with Wow, the song summing up most attendee’s feelings on what they’d just witnessed. Sat in Your Lap featured Preston Heyman’s stunning drums from the original track – it was a real highlight of the evening to watch him play. A powerhouse version of Aerial, the ever-thrilling Hounds of Love and Babooshka, and a gorgeous Moments of Pleasure lead up to a joyous finale with Cloudbusting. Mandy thanked the audience for trusting the band with the music they cherish so much. Outside in the foyer, fans were encouraged to write messages to Kate on a huge canvas print of The Kick Inside artwork and hundreds of notes to Kate were added to it over the course of the evening. Well done to Mandy, to Michael Mayell (keyboards and general Kate Bush mastermind! ), Dave Roberts on bass, Chris Voysey on guitars, Adam Aggiss on drums with visuals and production design by Nick Gregory. Outstanding all. Update: Due to the overwhelming success of the show, a repeat performance will be held on March 21st in Wolverhampton. See the Facebook event page here. The band will again be joined by two backing vocalists, string quartet and a saxophonist with hopefully some of the other very special guests that joined them in attendance. 1 Response to Del Palmer plays Kate Bush songs live for the first time in decades at 40th anniversary concert! I was there!!!! My sister is Julia Krajewska and it was amazing to see her in such a fantastic band! I have been a Kate fan all my life and know the songs inside and out and as a musician myself appreciate the incredible amount of work involved in producing such a professional and astoundingly brilliant show! Every song was lovingly reproduced. There wasn’t a dry eye in the house. I would urge anyone who loves music to go and enjoy the delights of Cloudbusting. To top it all, there was Del, Preston, Stuart, Guido, the strings and Fiona the sax player, not to mention the gorgeous dancers!!! This was the best gig I’ve ever been to. Can’t wait for Wolverhampton!! !